Using the poll option in Instagram Stories (which is a great lead generation tool, by the way), I proposed the statement: “If you don’t know where your next deal is, you need a new strategy.” A surprising percentage of respondents (41%) chose, “If it’s not broke, don’t fix it.” The problem, however, is that something is clearly broken if you are using a strategy (or don’t have a strategy) that elicits no result. That sounds backwards and it is. Unfortunately, when it comes to our follow-up strategy, some of us are using methods that are broken and don’t realize things can be another way—a better way. 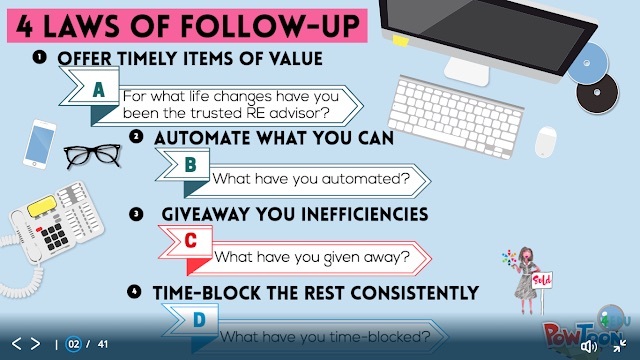 When you follow-up, how often is the content timely, relevant, and valuable? In other words, how often does your content speak to the person’s or business’s specific situation (e.g. personal milestones, opening a fifth location, downsizing, etc.)? Be honest. If you can say never, then grade this question with a zero. Which of your business inefficiencies have you given away to a competent company assistant or partner? Be honest. If you can say none, then grade this question with a zero. If you had any zeros on this quiz, then you are likely ignoring the “4 Laws of Follow-Up.” The following is an overview of the laws from my 4 Laws of Follow-Up workshop. How can you improve your answers to these questions? These improvements will help you fix your follow-up starting today.